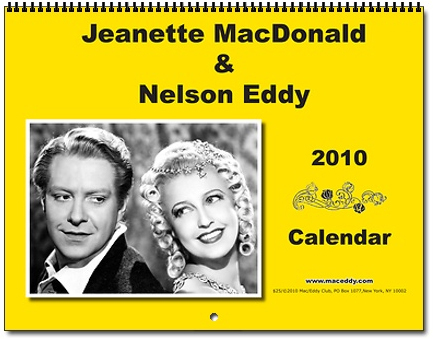 Jeanette MacDonald Nelson Eddy 2011 Calendar Released! It’s here, the 2011 Jeanette MacDonald and Nelson Eddy glossy calendar! Each month features a large photo plus dozens of trivia and dates that were important in their lives. This year the cover photo is from Bitter Sweet, their film that was released 70 years ago! 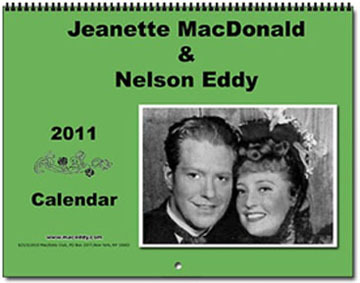 Jeanette MacDonald & Nelson Eddy 2010 Calendar Available Now! Jeanette MacDonald & Nelson Eddy fans – it’s here! The gorgeous, glossy new 2010 Calendar, with a photo for each month and dozens of important dates in their lives noted for each month. First review of 2009 Jeanette MaDonald and Nelson Eddy calendar!